The name of Monte Castello di Vibio comes from "gens Vibia", a noble roman family, however, the village origins have to be found before the romans. Today, the castle still dominates the village and the river Tevere which slides below. Due to its position, the close Todi always aimed to conquer it, and in fact Todi was able to conquer Montecastello di Vibio, however, to keep it and avoid revolts, it was forced to pull down the town walls. In order to use it as a strategic defense point, on 1303, Todi rebuilt the castle. 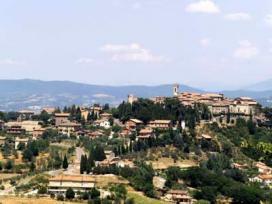 However it is only only on 1596, that Todi was able to fully control the town. During the age of Napoleon Montecastello di Vibio lived a very bright existence, and the village partecipated actively to the development of a new era. It is during this time that the Concordia Theatre, the smallest in the world, was constructed.